A traditional country pub and restaurant, situated in a quiet village close to Rowlands Castle within easy reach of the A3M and A27. Ample off-road parking is available at the pub, and a sheltered garden area and large field is situated behind. 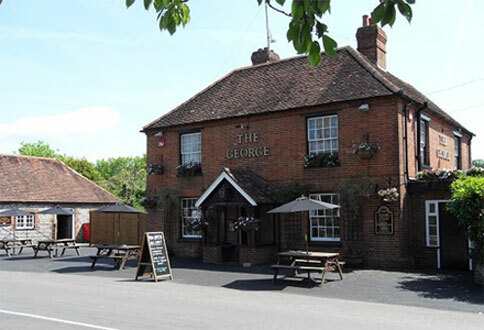 The George Inn at Finchdean dates from the 18th Century, and has been extended over the years - now offering a la carte dining facilities for up to 70 people! Families are most welcome. The restaurant has gained a reputation over the years for freshly cooked food, and wherever possible it uses locally grown, fresh seasonal ingredients. Along with an extensive bar menu and specials board, The George Inn offers a full a la carte menu as well as traditional Sunday roasts. The restaurant provides an ideal setting in which to enjoy the extensive menu and beautiful countryside of Hampshire!